Other gloves are worse either damage-wise or don't cover my pierce resistance. And that trap res is really helpful too. Most of my builds can be found in Build Compendium IX. Octavius injects a decilitre of horse hormones into untransmuted FW. Is there any gear you would change if you had it? Why is Manticore devotion in this build? 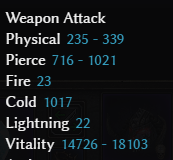 Only for ability proc? It's in 90% of builds because it's the only freely available flat resist reduction to many builds. Yes the nodes are often wasted but resist reduction is that important. Hi all. I'm usually lurking but loved this build and had a question. The intro says that cadence is fully converted to vitality. The conversions I see come from both edges of death, both haunted steels, the blood knight's pendant and harbinger of souls. Where does the remainder of the conversion to vitality come from? I should say it's "almost" fully converted. Yes, some physical damage remains unconverted anyway, this is how partial conversion work. 34% swords, 20% components, 12% pendant, 15% Harbinger = 81% in best case. In fact you'll have near 85k vitality damage and 4k physical damage on Cadence 3rd hit. So, remaining physical damage is near 4% of total damage and thus can be ignored. I had to replace cursebearer with deathlord's band and the belt with boneweave girdle and it still plays exceptionally well. Well, I recommend to find any Cursebearer - default, empowered or mythical, and equip it instead of deathlord's band. Cursebearer's RR proc working in huge AOE is magnificent and it supresses enemy regeneration too. Works well both in campaign and Crucible.